CEO and Head Developer here in Mystery Islands Music. 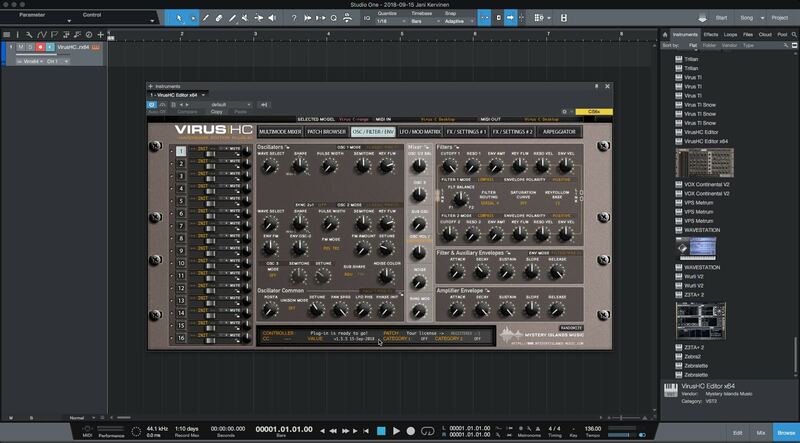 We build the market leading AudioUnit and VST Editor / Librarian plug-ins for hardware synthesizers. 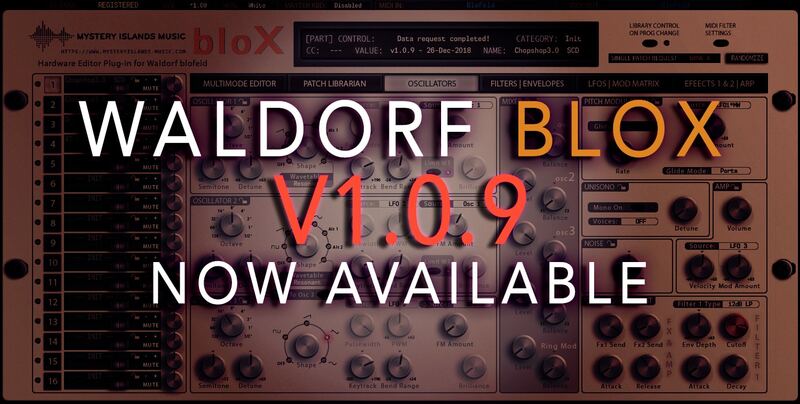 Korg microKxR AudioUnit & VST plug-in has been updated to version 1.3.3 with several fixes and improvements. This update is available now and it is ready for Mac and PC users. Download the update from https://www.mysteryislands-music.com/downloads/ after login. There was a nasty issue we overlooked on some of the non CC, MSB/LSB parameters which caused the sound go mental. This should be all good now, at least it worked here in-house while I was benchmarking it for the past 6 hours (ended up writing 8:53 trance-master piece hehe). It still might have some odd bits here and there which I have overlooked, but as usual, I will fix the issues as they appear. Use the forum to post your findings and I will check them out there. I will not look for other forums – there is enough work to look from one place. * [New] Implemented search function. Now user can search librarian files for patches based on the search term. This is case sensitive and if results are found, they are shown in the lower patch selection list. * [New] IF layer link switch is toggled on, both layers change their value as expected – Layer 1 is kept open. * [Fixed] When switching any of the non-CC or non-LSB/MSB knobs, buttons or menu items sound was completely messed up. * [Fixed] Program Change buttons work as expected. * [Fixed] Total Recall works as expected. * [Other] Removed EG2/GATE toggle switch and Filter & Amplifier Velo Sense knobs from the GUI as it did not work for microKorg. * [Other] Fastened up the patch change process if sent via the plug-in librarian to hardware. 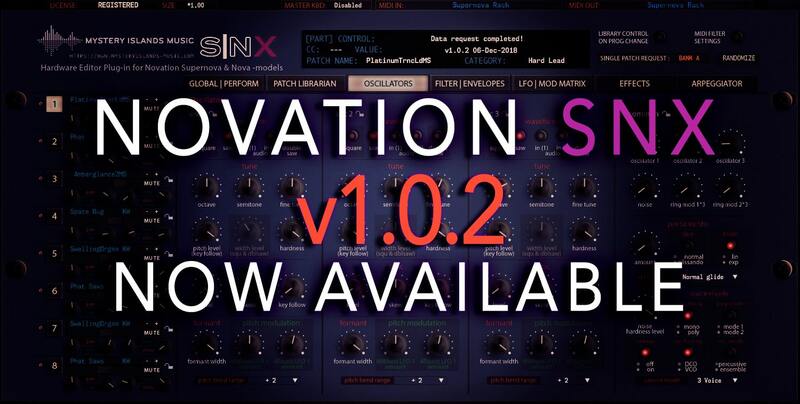 Novation SNX has been updated to version 1.0.2. This is a big update for the SNX AudioUnit & VST Editor / Librarian plug-in, which is shipped with Library improvements, new features and bug fixes. You can read more about the updates from the change log page. This update might not be compatible with previous version of the plug-in, but it is surely better in overall functions than previous version. Customers can head down to downloads PAGE and download the latest version from there. Demo version is available at the product page and 32-bit installers are under downloads TAB. As always, thanks for the support and keep posting the bugs to our forums. We are gonna take a look at each and every one of those. 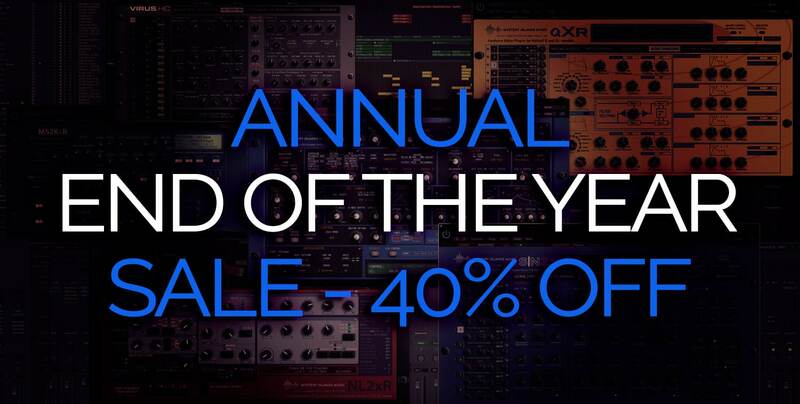 It is that time of the year again, when we launch our Annual End Of The Year Sale. This year, we are running the campaign until January 1st 2019. Be sure to check out the deals well before the deadline! Starting today, all products in our store are at least 40% OFF. 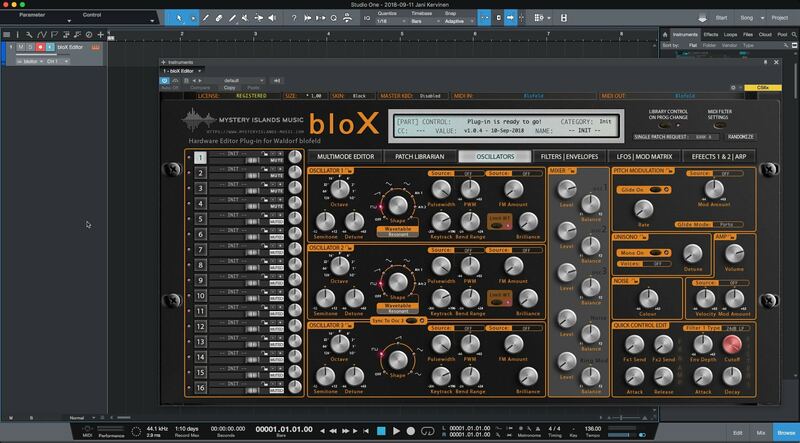 Check out the plug-in bundles if you want to get even better discounts. Plug-in news: Search function is now implemented in to our SN2x plug-in along with resize-able GUI etc. We will distribute the new installers asap and we will deploy the search functions, resize-able GUI functions plus a lot more to our other plug-ins as well. Finally we made break through with Access VirusHC Update version 1.5.6! [Fixed] Resolved issue where Pitch, Aftertouch and other controls were not passed through the plug-in. [Improvement] Made some minor core changes to make the MIDI stream work a bit more light weight. [New] Added experimental MIDI clock generator AND advanced MIDI filtering options to VirusHC plug-in. Advanced MIDI settings can be accessed from Multi Mode & Patch Browser tabs. Button appears right above our logo in the bottom right corner. [Fixed] Resolved issue where FX was not recalled properly on pre-TI models after project was opened. [Fixed] Tempo data should now synchronize with Virus on project recall and while initializing plug-in. [Fixed] Resolved issue where DAW would crash when resetting all notes. [Fixed] Adjusted some MIDI out detection booleans to make sure MIDI connection is alive. Below you can see how the new Advanced MIDI Settings view looks like. And the location of the Advanced MIDI Settings button (bottom right corner).